I grew up on a lake in Michigan. Two doors down was a boyhood friend named Andy. Andy and I were good friends growing up. Andy and I were way different in many ways. Andy was a tinkerer. He always had a project that was in progress. Maybe rebuilding a bike, a lawnmower or repairing the family camper. Andy always had a project or two that was in progress. His father was an engineer, and Andy had a mechanical mind that I am convinced was at least partially genetic. His father also encouraged him to figure out how things really worked. I remember visiting his house and helping him repair the oil burning furnace in his basement. Now this is a 13 year old kid- yes with direction from Dad- repairing an oil furnace! I admit, there was generally an excitement with doing these projects. My dad would never give me the latitude to tackle a project like this but Andy was encouraged by his father to do crazy and challenging projects. One of Andy’s projects was rebuilding an old wooden sailboat. This boat was not pretty or remarkable. It was a common sailboat, probably about 16 feet long. Most everyone thought the boat was simply junk and was a lost cause. The boat was made entirely of wood with many parts broken, missing or in need of stripping and refinishing. Andy kept the boat on the side of his family’s house under a tarp. Andy completely dismantled the boat, and over time, began to rebuild it. This process went on for several years. I remember going to his house to see what he was doing and getting a lesson on how the keel worked or what repair was necessary for the rigging. The boat contained many typical marine materials, weathered teak, marine plywood, brass screws, stainless steel cables, etc. I learned a great deal from Andy about boat construction and marine components. Andy had a paper route that financed his boat rebuilding efforts. I was often his back-up or companion while he delivered the Detroit News. He had a relatively small route and I knew first hand that the money that he made was hard earned. For several years, Andy poured much of his earnings into that sailboat. Marine parts and supplies are very expensive. My father was convinced that the label “marine” just was a way to double to price! I remember Andy telling me about his latest purchase- marine varnish, brass fittings or mahogany and knew immediately that I would never spend that much money on that boat. Yet, slowly over time he was making progress. One year as the summer was waning, Andy and I talked and agreed that we would- somehow- sail the boat before the lake iced up for the winter. The idea was to just put the boat together so we can sail it. We were missing parts and some stuff needed some pretty intensive work so we would overlook those items and just make it sailable. Let just sail the boat. So, over a period of several weeks, we worked after school and into the night under lights reassembling the boat and working to put the boat in service. Andy was especially committed. I did my best to sneak off from my parents to give him a hand, but it was really Andy that was determined to sail the boat that year. See, Andy bought the boat in disrepair, so he had never experienced the boat under sail. We worked tirelessly putting the boat back together. Many of the parts had been refinished, yet many were missing, so we found ways to fabricate temporary parts. We were especially concerned about the keel area. Andy patched and sealed the keel and was still unable to get the area completely sealed. It still leaked. We would make sure that we included a suitable bucket for bailing if the keel was still leaking. The weather was getting increasingly colder. Most of the docks on the lake were out in anticipation for the winter ice up. Andy put the finishing touches on the boat and we targeted the next day for the sail. We were under the gun. This was early November. So after school, we fitted the boat for the first sail. We were bundled up and there was a steady wind. The weather was cloudy and it looked like rain. I was a bit nervous. The boat had never sailed. Many bad things could happen- we could have a giant leak, broken mast, the keel leak, rudder problems, etc. There were no boats on the lake to help us out. The water was real cold. We knew we were on our own. Yet we pushed the boat out into the lake and prepared to raise the sails. The first minute was a bit chaotic. We were not a very experienced crew and we were really tripping over each other. Yet, after a few minutes, the boat began to lean over under the weight of the sail and we were picking up speed. The boat was actually sailing. I wish all of the naysayers could have been sitting in the boat with us! The “POS” boat that was nothing but junk to most was actually sailing! I felt a tremendous feeling of accomplishment. Yet, this was really underscored by the delight that I saw in Andy. He was glowing. My involvement in his project was limited- yet he was involved in every screw, every component and every piece of rigging. His joy was amazing. I will never forget it. We let out a few hollers of joy across the cold water and laughed in victory as we made our way across the lake. We took a quick look at the boat. The keel was still leaking. We had some issues with the rigging. We talked about the future repairs and improvements that we would make. Yet, for the most part the boat performed pretty well. After sailing for about an hour it stated to rain. Not hard, just enough to make it ridiculously cold. We looked at each other and decided to head in. We planned another sail the next day when it wasn’t raining. We pulled the boat up on shore and pulled over the cover. What an amazing day! We actually sailed Andy’s boat! Well, the next day came and went. And the next and the next. We didn’t get to sail the boat again that fall. In fact, to the best of my knowledge, the boat was never sailed again. The boat sat covered on its trailer for another year or two until Andy eventually sold the boat. I don’t know if the act of sailing the boat was enough victory that Andy lost interest in the project or if he just couldn’t get the time to properly complete the process. It really didn’t matter. In my eyes, Andy did it. He took a project that was viewed as impossible and he pulled it off. I learned a great deal from this project. Some of it was practical marine stuff, but the more valuable lessons were about love and not giving up. You see, Andy loved that boat and he wouldn’t give up on it. He put his heart and all of his money into the boat. I think he would say that it was worth it. Even after all of his time and money. 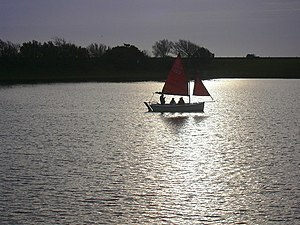 Even just for a single solitary sail on a cold November evening! Back in the early 90s, Kathy and I particularily enjoyed a restaurant that had an appetizer specialty called teacup bread. The bread would arrive warm and still nested inside of a teacup. This was a really special treat. The bread was light and soft and had a sweet flavor. You really could eat this bread for dessert. We loved the food at this place, but really, the bread always brought us back. We would get several servings. Warm, sweet bread. I really want some right now! Warm bread is a great way to invite guests into your restaurant. The smell, the taste- every sense gets bathed with great bread offered as an appetizer. 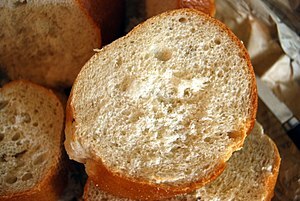 I remember several restaurant experiences where the most memorable part of the meal was the bread. Warm and inviting. Something really special that leaves a lasting memory. I have also had the pleasure to meet people that I would say have the characteristics of warm bread. Upon meeting them you are immediately enveloped in warmth. You can feel the love ooze from them. Like the bread, they leave a lasting memory. You can’t help but think about them. They are like the teacup bread- you want to go back for more. Focus: They are completely focusing on you. They look you straight in the eye as you begin to talk to them. You are the only person in their world. They have the skill to shut off everything else. Smile: They start with a smile and have a way to continue to smile throughout the conversation. The smile is a powerful tool. A smile disarms. A smile invites you in. A smile tells you that they are enjoying your company. Genuine: They are genuine in every way. They want to know about you. They are humble and authentic. There is no agenda. The focus is personal. Listen: They are skilled listeners. The questions are based on getting to know you. They do not lead you in a particular direction for their benefit. They allow you to tell your story and let you enjoy doing it. Connect: They are skilled at connecting the wires between you and them. They will seek out common characteristics and interests. You will share ideas, struggles and experiences. You will feel like you have known them for years. Easy: They have a way to navigate through a conversation that makes it fun and enjoyable. No awkward quiet moments. No challenges. You will have the opportunity to share a little or a lot- your choice. Time flies by as you talk and connect. Have you been there before? Can you think of someone you have met who is unusually warm and engaging? OK- confession time. I am not that person. I would characterize myself as crusty rye bread- not tea cup bread! I struggle with focus. I tend to be serious, so I typically have to remember to smile. I tend to talk only when I need something. I am content to sit in silence. This is my nature, however, I am aware of it now. I have to make an effort to be the warm bread. It doesn’t come natural to me, but I am learning and I recognize the power that warm bread has. My typical nature is selfish and I know it. However, I am getting better- much better! We often overlook the effect that we have on others. A smile goes a long way and it is such a simple gesture. Are you a warm bread person? Do you focus on others instead of trying to get out your story? Are there areas that you can work on as you interact with others to make yourself inviting? Like the tea cup bread, once you master the skills of warm bread you will bring them back over and over again- a warm and sweet relationship! Do you know someone with these skills? Share your story by clicking on comment below! Every July 4th we would travel as a family to Frankfort, Michigan to enjoy the festivities. Frankfort is an idyllic northern Michigan town located on the shores of Lake Michigan (OK- look at your left hand and it is located just below the end of your pinky finger- this is mapping Michigan style!). The 4th was big stuff in Frankfort. They would have a whole list of happenings which always included a parade down Main Street and a grand fireworks display. I am sure that they still are celebrating the 4th of July the same way. These towns are locked in time- you can come back years later and it’s exactly the same. It’s comforting really. In the midst of the light speed world, it is comforting to know that you can go back and things are pretty much the same. But this is not the topic here. Our trips to Frankfort began one year after we found a great campground and we enjoyed the weekend so much that we returned the next year. And the next. And the next. And the next. I am not entirely sure how many years we returned, but we were probably close to a run of ten years in a row. We even started to bring other families who also returned with us year after year. A great place to be for the 4th. But this is not the topic either. My kids loved this trip. It was really the highlight of our camping summer. Not because it was really super great. We camped at many places that were more spectacular. Yes- My daughter established a relationship with the daughter of the guy that owned the hardware store on Main Street. Yes- We loved the clean goodness of the town, the activities, and Lake Michigan. Yes- It is a strikingly beautiful area. Again, not the topic this time. The thing that made this trip great was that it was a family tradition. There was no question about where we were going for the 4th. 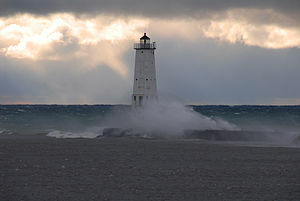 We were going to Frankfort, Michigan. Period. Traditions are really important for families. We had a few good ones, but Frankfort on the 4th was really special. Traditions have a way of binding you together- really tightening the bond of a relationship. I can’t completely explain it. It’s a strange thing. I only know that it’s important and powerful in families. Traditions can have a similar effect outside of families. They are also great in work environments and other group settings. Drawing you closer. Binding you together. Giving you an identity. Repeats: A tradition must be repeated. Can’t be a one shot deal. You absolutely can’t miss- must repeat as scheduled. Improves: A good tradition will improve over time. This can be a challenge, but it needs to have a flavor of being new each time. At least a little twist. Total Involvement: Everyone needs to be involved. 100% participation. Again- this can be tough but you can do it! Make it something universal. Fun: Absolutely has to be fun. And really- goofy can be great here. Come up with something that is out of the box. Kids really love this stuff and we are all just old kids- right? Planning: Planning is an important part of it. Talking and planning extends the experience and the power of the event. Start planning the next year while you are wrapping up the previous year. Leaders should take advantage of traditions. If you host an event that just explodes in popularity, why don’t you repeat the event and make it a tradition? I believe that traditions are essential in families. They give you something special that gives you a unique identification. Take advantage of this! Come up with a few traditions for your family. Traditions are natural goodness- just like Frankfort, Michigan over the 4th of July! Do you have a family tradition that you would like to share? Please click on comments below and tell me your story!